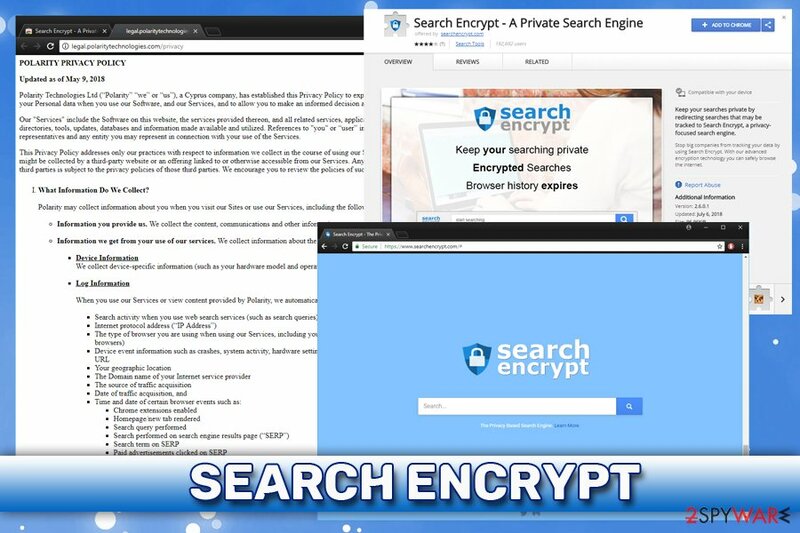 Search Encrypt is a suspicious application that was created by a well-known browser hijacker creator Polarity Technologies Ltd.
Mostly targeted browsers Chrome, Safari, etc. 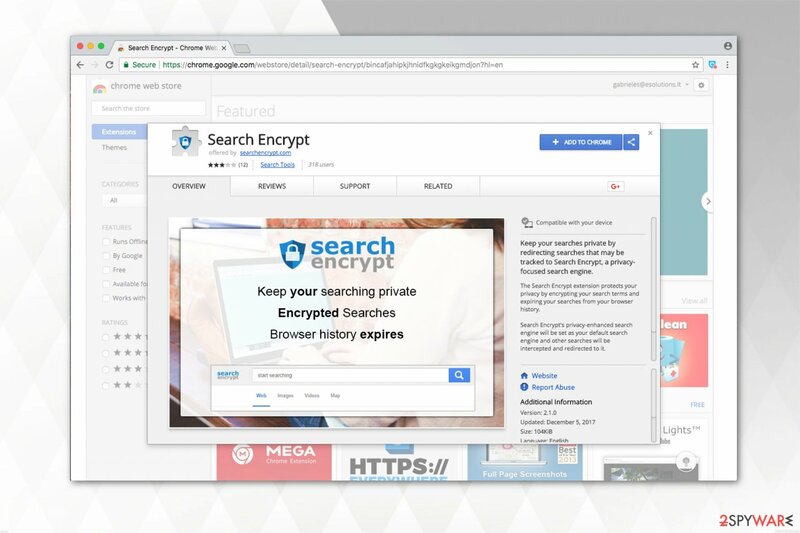 Stop big companies from tracking your data by using Search Encrypt. With our advanced encryption technology you can safely browse the internet. Changes that are typically initiated by Search Encrypt virus might impact your browsing experience in a negative way. For example, you can be interrupted by continuous pop-up ads and also redirected to websites that you didn't expect to visit. Developers of this extension do not provide any guarantee related to “the accuracy, relevance, timeliness, or completeness” of the content, so there is a great risk of getting infected. If that is not enough, people are unable to simply get rid of this unreliable application from Mac and Windows OS. That's why we highly recommend using automatic tools to delete Search Encrypt from the system. Reimage could be one of them. 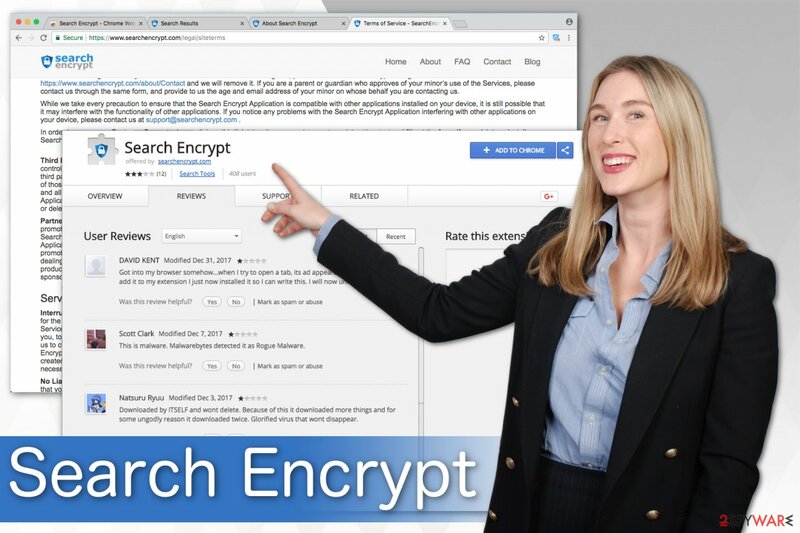 Many people cannot figure out how to remove Search Encrypt from Google Chrome since it is programmed to reassign the settings mentioned above once the user tries to change them to the previous state. Note that there are other versions of this browser hijacker like Searchencrypt.navigateto.net and Searchencrypt.com virus which might also infect your system. As we have already mentioned, search results delivered by Search Encrypt and its variants are distorted by sponsored ads. Usually, they promote affiliate websites or products which help the developers to generate revenue by pay-per-click marketing scheme. Note that intrusive ads might not only be annoying, but malicious as well. This means that it might also display potentially dangerous ads which can lead you to either a shady website or trigger an automatic installation of malware once clicked. Therefore, we suggest you initiate Search Encrypt removal without wasting any time. For that, you can use the manual elimination guide below or run a full system scan with your antivirus. As mentioned above, this browser hijacker can be willingly downloaded from the Chrome Web Store. However, users report that this potentially unwanted program also manages to sneak into the system without permission. This happens when people install free software inattentively. Usually, users choose Quick or Recommended settings in the installation wizard and skip many steps. This is the reason why users are unable to notice the browser hijacker which is bundled with freeware. Likewise, NoVirus.uk team says that you should always opt for Advanced/Custom mode, which will display optional installs and give a chance to eliminate them before the installation is finished. Not clicking on various pop-ups or suspicious ads. While Search Encrypt virus is unable to pose harm to your computer itself, it can expose your system vulnerabilities and help infiltrate malware. Note that there are additional components which may support its activity and hide under different names. Uninstalling them can be challenging. Thus, we recommend an automatic elimination procedure. You will not need to worry about how to remove Search Encrypt from Mac or Windows, merely download an antivirus tool from the list below and run a full system scan. Note that you can use another security software of your choice as long as it is reputable and powerful enough to deal with potentially unwanted programs. We have prepared manual Search Encrypt removal guidelines for those who seek a challenge. They are presented at the end of this article together with the guide to reset your browser to the primary state. If you follow the instructions attentively, your computer will be hijacker-free after the termination procedure. If you have encountered the hijack of your Windows, follow the instructions below to remove this potentially unwanted program on Windows. Here, look for Search Encrypt or any other recently installed suspicious programs. You should delete all suspicious entries which might be related to the browser hijacker to clean your Mac. Wait until you see Applications folder and look for Search Encrypt or any other suspicious programs on it. Now right click on every of such entries and select Move to Trash. When in the new window, check Delete personal settings and select Reset again to complete Search Encrypt removal. Once these steps are finished, Search Encrypt should be removed from your Microsoft Edge browser. Here, select Search Encrypt and other questionable plugins. Click Remove to delete these entries. Now you will see Reset Firefox to its default state message with Reset Firefox button. Click this button for several times and complete Search Encrypt removal. 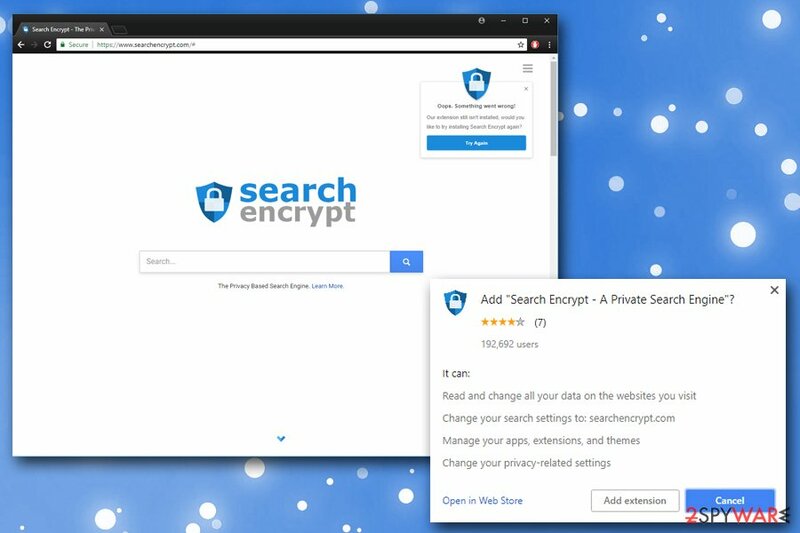 You can fix Chrome by uninstalling Search Encrypt extension. Additionally, search for other suspicious entries which might disrupt your while browsing and remove them as well. Later, reset your browser to finish the procedure. Here, select Search Encrypt and other malicious plugins and select trash icon to delete these entries. Click Reset to confirm this action and complete Search Encrypt removal. 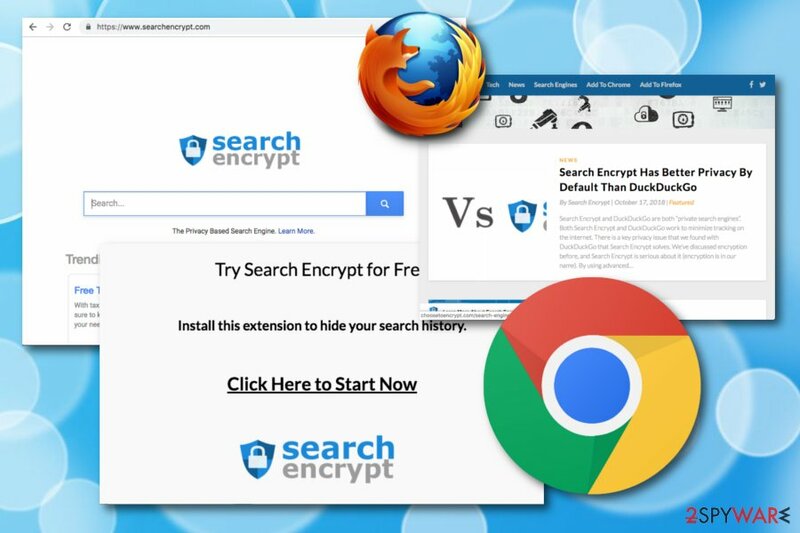 Here, select Extensions and look for Search Encrypt or other suspicious entries. Click on the Uninstall button to get rid each of them. Here, look at the Homepage field. If it was altered by Search Encrypt, remove unwanted link and enter the one that you want to use for your searches. Remember to include the "http://" before typing in the address of the page. Now you will see a detailed dialog window filled with reset options. All of those options are usually checked, but you can specify which of them you want to reset. Click the Reset button to complete Search Encrypt removal process. ^ Margaret Rouse. Browser extension. What is. Tech target. ^ What is the Chrome Web Store?. Google Web Store Help. ^ Noah Gamer. Ads on websites are dangerous to more than your sanity. Trend Micro Blogs. Security News, Views and Opinions. You can quickly scan the QR code with your mobile device and have Search Encrypt manual removal instructions right in your pocket. How did you remove Search Encrypt?